Vintage Pin By Lucinda, this is a leaf pin, with a sun house and fence with a corn stalk or tree. It is 2-1/2” by 1-1/2”. Please see all photos. Please if you have any questions, please ask before bidding. Please check out our other items for sale. Good luck !!!!!!! LARGE Unique Sterling Silver Abstract Tree Brooch ~ Artisan Piece? ~ AWESOME! 7 pieces lot of asaorted vintage Pins By Lucinda. There are: 3 House Pins, 1 is missing the label on the back. 1 Book Pin 1 Little People Pin 1 By Lucinda 1 Designs by Lucinda All in excellent condition. All weareable. Sold as is. No returns. Happy bidding! Pin is in good condition. ~Sterling Silver. 925/stamped 'Far Fetched Sterling'. ~Big kitty in good shape, little kitty has a few scratches and a dent where the tie back pushes in. Super cute! ~ Tie tack closure. This beautiful brooch/pin features an exquisite Sterling Silver Modernist Dangle design with a Scenic Petroglyph motif and is set with a stunning Faceted Carnelian stone so I KNOW it has a spot in your collection, or would be a perfect gift! 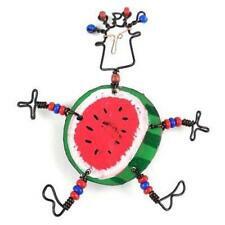 New ListingPATRICIA LOCKE Small Brooch. With Crystal Stones. PATRICIA LOCKE Small Brooch. With Crystal Stones. . Condition is Pre-owned. Shipped with USPS First Class Package. Got this piece at an estate sale. There is no nickel in the metal. Her metals are outer and or silver. This item is in great condition. Take look at all pictures. Thanks for looking. The metal is silver tone. LUCINDA HOUSE PIN. that looks like a storm is brewing. Nice colors. This one features a house with a cat and a background. 1-3/4" x 2-3/4" (not including string/ribbon). 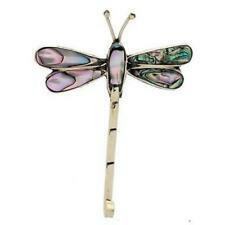 ~~ PIN / BROOCH STERLING SILVER LAVENDER STONE w MARCASITE BEAUTIFUL ! It is 1-1/2" across and 7/8" up and down. It glitters but not excessively. Of course it is much prettier in person than in the pictures. Just silver. You will be delighted with the pin. The pin weighs 7.9 grams. Sterling Silver Dolphin Pin. 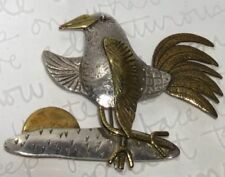 This is a beautiful Sterling Silver Dolphin Pin. It is artist signed on the back side, B.W. and Sterling. ….1 1/2 " round. unsure of what it is made of.molded clay??. guessing a face?. Large Stuart Nye Hand Wrought Sterling Pin Reduced! It is marked: EFS, 925 and shows light wear. Lucinda READ pin, with promotional card. Great gift for teachers or readers. LUCINDA PEOPLE PINS. Lucinda people pins. Great to add to a collection. Tiger's Eye, Crystals and Seed Glass. BROOCH IS 6 1/2" BY 2 1/4". This unique Scottish Pennanular Brooch or Cloak Pin has been hand-forged and twisted from from a rod of steel. 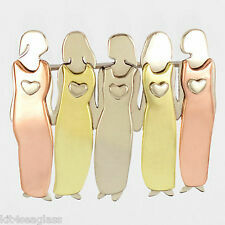 This strong brooch can be worn several different ways depending on the style/look you are going for. 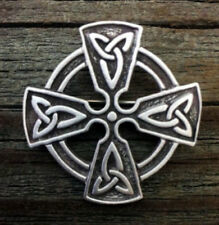 This beautiful pendant represents that well, and is considered to be a mix of Viking and Celtic art styles. It has a steel pin along the back to fasten to your clothing. Monsta X Shownu Fan Made Pin. "The Game: MX Kingdom". This design was inspired by their 3rd fan Club membership goods. This is a Hard Enamel Pin. Already on hand and ready to be shipped. Shipped with USPS Media Mail (2 to 8 business days). With the purchase of the Pin, you get a FREE phone charm with the MX symbol and a FREE fan made photo picture of Shownu. 1-3/4" x 2-1/2" (not including beads that hang down). (5219J)LUCINDA PIN SPARKLE BACKGROUND WITH TWO PART HOUSE,BUTTERFLIES AND BICYCLES. 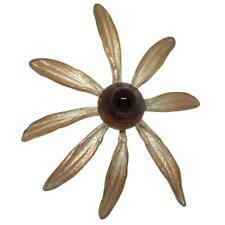 This is a beautiful Lucinda pin. This has a golden sparkle background. This has butterflies above, bicycle to the side and the other side is a fence, birdhouse and cat. Though not marked sterling, it has been tested. It is in very good pre-owned condition with only light tarnish. Marked DRUMM on back. Large goldtone pin/brooch with hole for pendant wearing. Ireland Geese Sterling Brooch Pin A. J. B.
Ireland Geese Sterling Brooch Pin A. J. B.. 2.5 inches across. Condition is Pre-owned. Shipped with USPS First Class Package. Item House Pin by Lucinda. The pin is in good shape. VINTAGE HOUSE PINS BROOCH BY LUCINDA, Spring is Here, Green, Peach, Blue & White . Condition is Pre-owned Mint Condition. 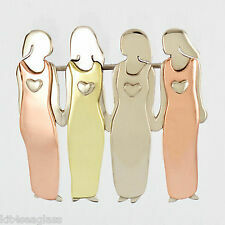 Pins measures approximately 1.5"H x 1.75"W. Shipped with USPS First Class Package. Owl size : 4 x 2 cm. Necklace size : 50 cm. Materiel: alloy crystal. THIS PIN IS REAL NICE AND MADE WELL. Liztech Slug. Condition is Pre-owned. Shipped with USPS First Class Package. Excellent condition engraved woth signature and year 2002. Rare vintge handcrafted with chrome architectural design that prevents the mirroron brooch to shatter so it wont break. Collecters item for a company that closed in 2017 after 33 years will be worth more with time these arenone of a kind. It is in wonderful condition and has lived in its box for many years. See photos for details. Our exclusive high quality TRUBARBER lapel pin. Beautiful Zarah brooch on original card - never worn! Gilt Sterling Filigree. Unique fan shaped form with a delightful filigree ground. Nice gilt silver finish. Brooch Pin. Chinese Export. An outstanding example of sterling silver artistry of Chinese origin. Nutcracker Lapel Pin - Made in USA! PATRICIA LOCKE Small Brooch. With Crystal Stones.